Relocation is the culmination of all the efforts that have taken place thus far, the prairie dogs are going to their new homes! The initial steps are the reverse of the staging process. 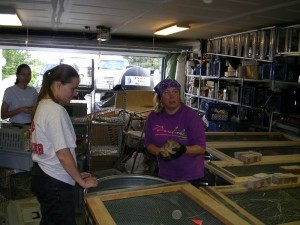 The prairie dogs are checked one last time then placed in kennels for movement to the relocation site. 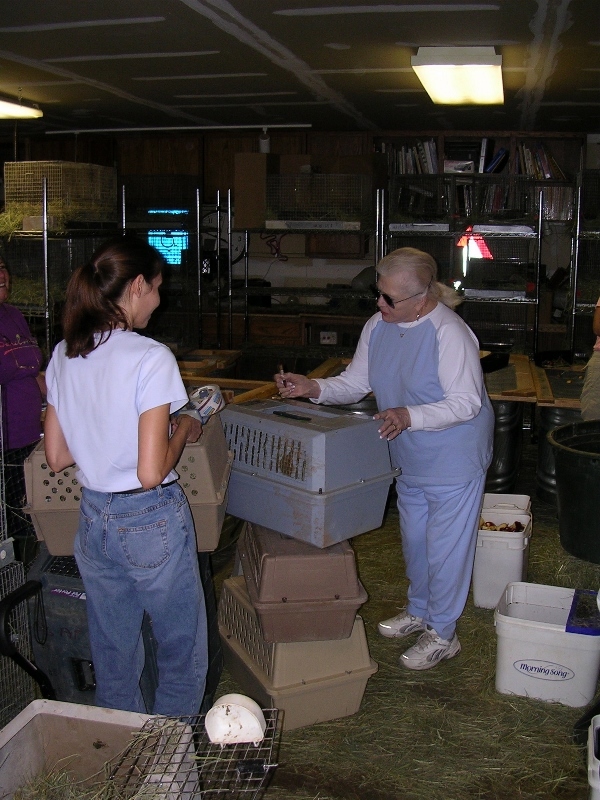 Volunteers identify the kennels with respect to the prairie dogs and target relocation area. The prairie dogs are moved from the holding tanks and cages to the kennels. At the relocation site time and temperature are always a factor. Every effort is made to keep the prairie dogs from over heating. The cage caps are stuffed with hay. The hay serves as both food and bedding for the prairie dogs. Food dishes are placed in each cage cap. 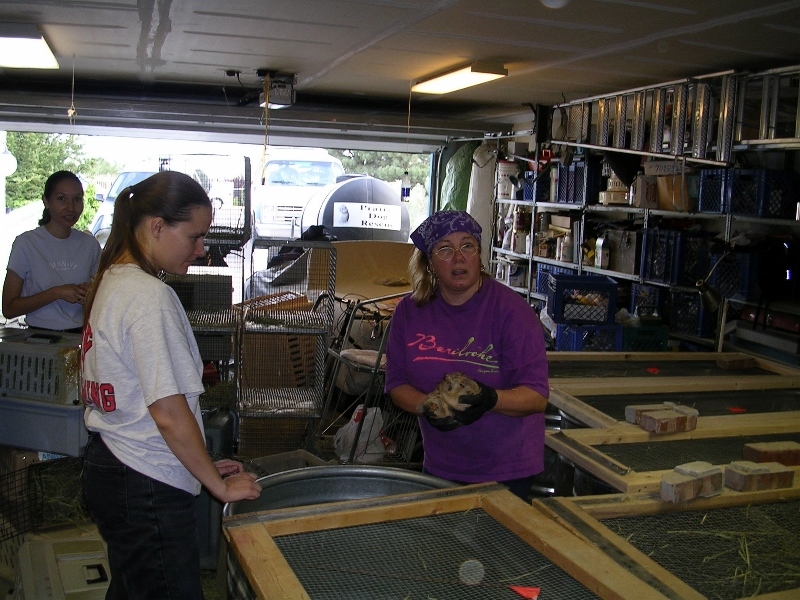 When all is ready the prairie dogs are moved from the kennels or cages and placed into the tubes leading to the nesting box. The cage caps are set and staked in place. 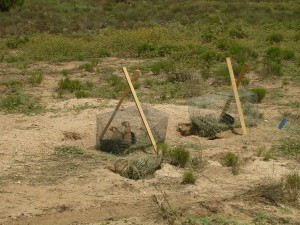 The hay and food are replenished for up to 5 days after which the prairie dogs are allowed to “escape.” Here you can see the prairie dogs in the cage caps. They can acclimate to their environment while being protected from predators. Once the prairie dogs have “escaped” the cage caps are removed. The prairie dogs will continue to use the artificial burrows to escape from predators. 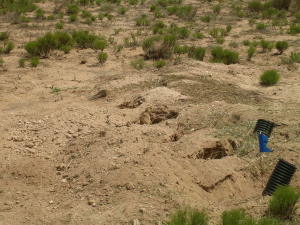 Ideally, the prairie dogs will start digging their own natural burrows nearby as can be seen above. 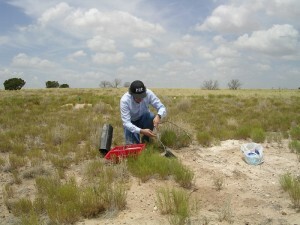 Eventually the prairie dogs will move further a field establishing new coteries. 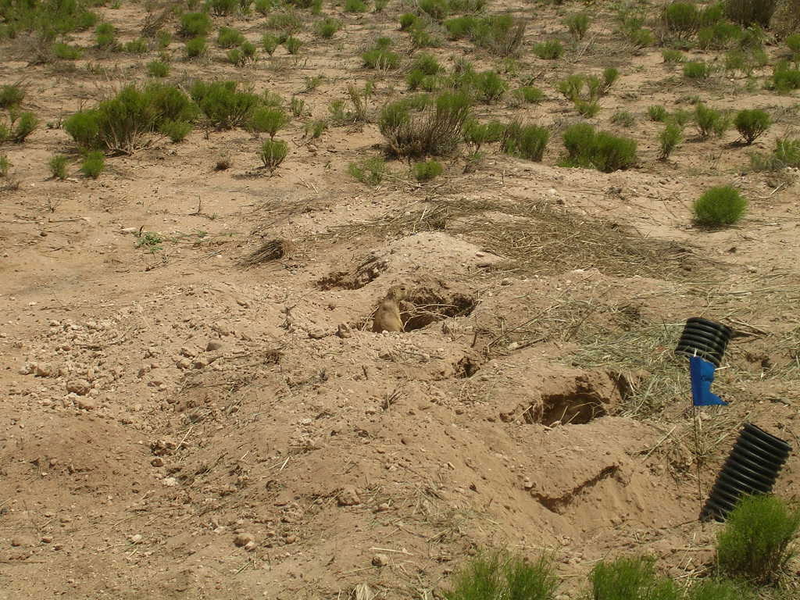 Once the prairie dogs have established their permanent residences we will reutilize the artificial burrows. We use a camera to inspect the artificial burrows, and if unoccupied, reuse them for other relocations from the same colony.